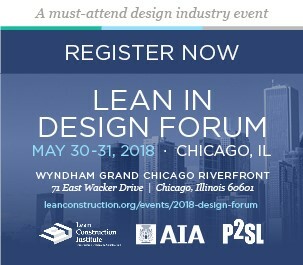 Lead architects and owner’s representatives from three project teams will candidly share the value of engaging designers early in the Lean process at the 2018 Lean in Design Forum‘s plenary panel on May 31 in Chicago, Ill.
Panelists from The Lean Trilogy: Three Teams Discuss “The Good, The Bad, and The Ugly” will also openly discuss the challenges they faced when asking designers to attend meetings they traditionally do not attend. From this panel, Lean in Design Forum attendees will learn how one of Chicago’s largest owner organizations, University of Chicago Medical Center (UCM), could break free from routine, reshape its entire community and lead a Lean transformation alongside designers, general contractors and trade partners within a two-year span. How did UCM decide to make this transformation so quickly? Rich Seiler, moderator of the panel and Unified Works Lean coach, says UCM’s Operational Excellence Team had been successfully promoting Lean thinking in its health care approach for about five years when the CFO and CEO turned their attention to Lean design and construction. The panelists will reflect on how they saw designers benefiting at all parts of the Lean process and how their involvement enhanced projects by ensuring on-time delivery, resulting in a “win-win” for all stakeholders. The panelists will also explain how designers can start a Lean in design journey from within their own firm – particularly relevant if the owner involved has not already bought in with the Lean advantage. Lean is about more than tools and processes – it’s about collaboration and big picture perspectives. Discover what can happen when designers and teams jumpstart the Lean process together by attending the 2018 Lean in Design Forum, May 30-31. Check back again soon for more 2018 Lean in Design Forum agenda highlights and find more updates on LCI’s Twitter, Facebook and LinkedIn!